The River Women's Ministry is a friendly, welcoming group that hosts a variety of events every year. These events include Movie Nights, Tea Parties, Bonfires and other powerful events with great Bible studies! More importantly, there is a culture of friendship and support grown and deepened on a weekly basis. This is a great place to get involved if you are looking for strong friendships and a great support network. They also sponsor the Sunday Night Prayer Group (6:30 pm at The River), but everyone is welcome to attend. See Debbie swanger to get involved in the women's ministry. The Men have a dynamic and impacting role in the River ministries and events that incorporates not only "Guy's Night Out" activities but also leadership and initiative on community service projects. The annual Men's Advance at the tree farm is one of the most notorious events only for those willing to brave exposure to the elements and copious amounts of bacon; it's hugely popular. They also plan Bowling Nights, Waffle Eating Trips and volunteer opportunities to help the local Delaware community. It's a great combination of fun, fellowship and purpose. See Kenny ballenger to get involved in the men's ministry. Orphan Outreach is a non-profit ministry that raises money to support children around the world. Orphan Outreach has sent funds to children in Cambodia, Kenya, Haiti, India and other countries. All monies collected by the ministry are used to provide for children in need, including education, school materials, food, healthcare, clothing, and other provisions. Kroger sponsors a program that allows customers to donate a percentage of their purchase to a non-profit organization by using their Plus Card when they check out. When you sign up for this program on the Kroger website and select Orphan Outreach to receive a percentage of your grocery purchase, Orphan Outreach sends the money to countries around the world to support orphans. When you check out, there is no additional charge to your bill, Kroger donates a portion of your total purchase. So you are able to take care of children that would otherwise have little hope, and without spending any extra money. You were going to buy the groceries anyway! MAARS is an Addiction Recovery Network founded by Musicians and Artists but open to everyone. People struggling with addictions can contact others who share their particular walk and have found healing through Christ. To serve others and glorify God in both word and deed by providing the solution and guidance through the Gospel of Jesus Christ. To grow the kingdom with honesty, integrity, and hard work. To intentionally, through the strength and grace of the Lord, give back to our community and make individual lives better. "Commit your works to the Lord, and your plans will succeed” (Proverbs 16:3). Tri-Township Donation drive for P.I.N. The River supports a variety of ministries around the world. 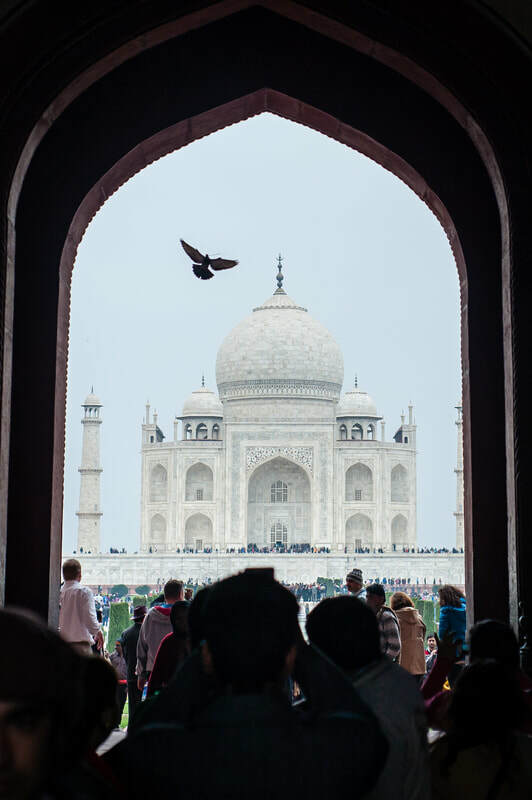 The church partners with ministries in India like Gospel to the Ends of the Earth and Harvest Mission for Christ to feed and care for orphans, provide clothing to those in need, support to people in poverty and leper colonies, and medical care. 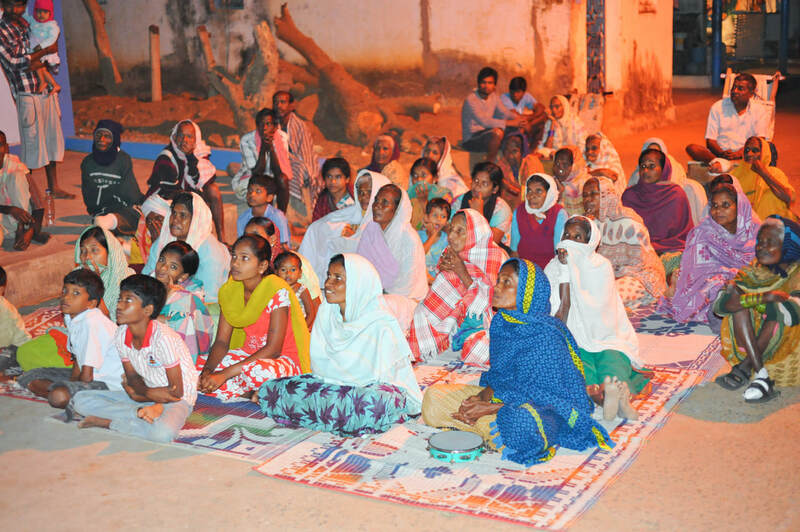 There are special ministries that offer opportunities to widows and women rescued from slavery. They receive training in how to sew and then a sewing machine so they are able to produce an income and support themselves. 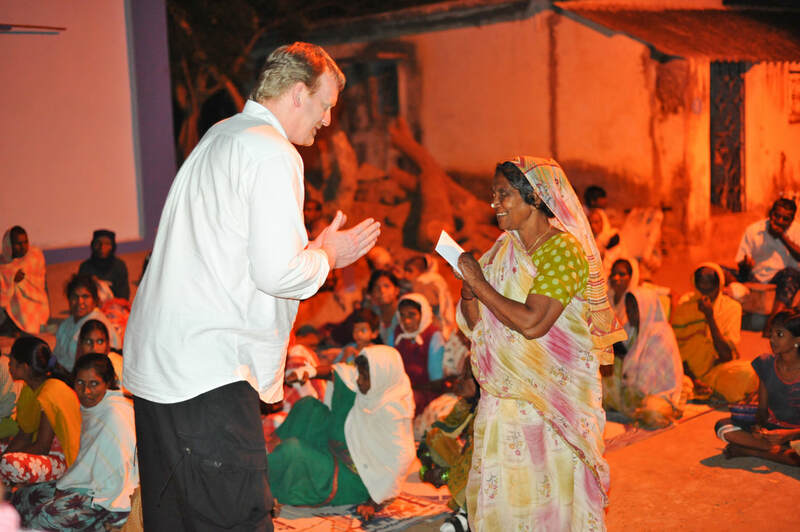 The River also supports Bible colleges in India that raise up pastors to take the gospel across the Asian continent. 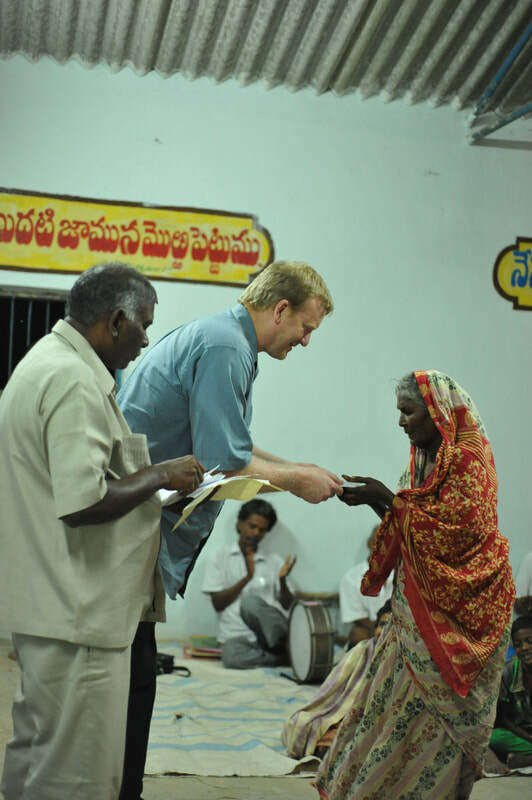 Pastor Bob (above) offers a gift of money to a person with injuries from the bacterial infection of leprosy. These patients are forced to live in isolated communities and not allowed to travel. 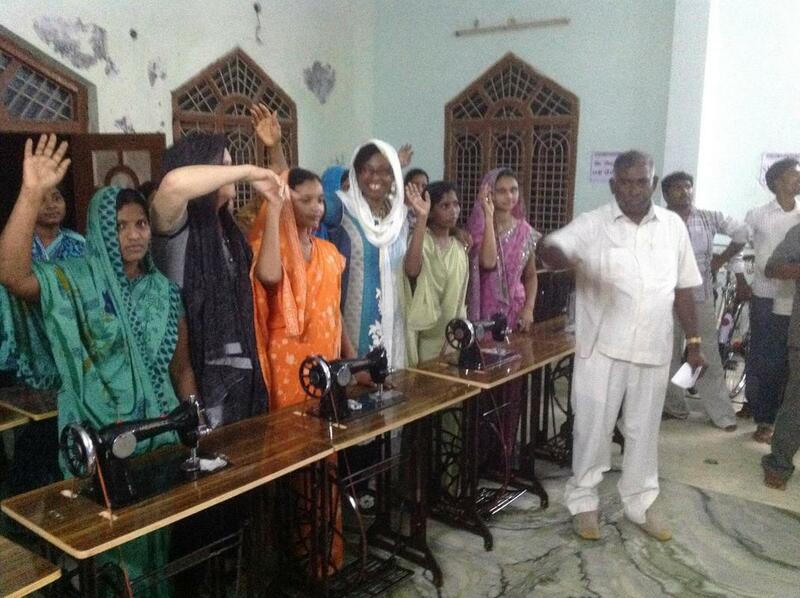 A group of women (right) receive sewing machines so they can work and earn money. The sewing machines are foot powered because of the high price of electricity. 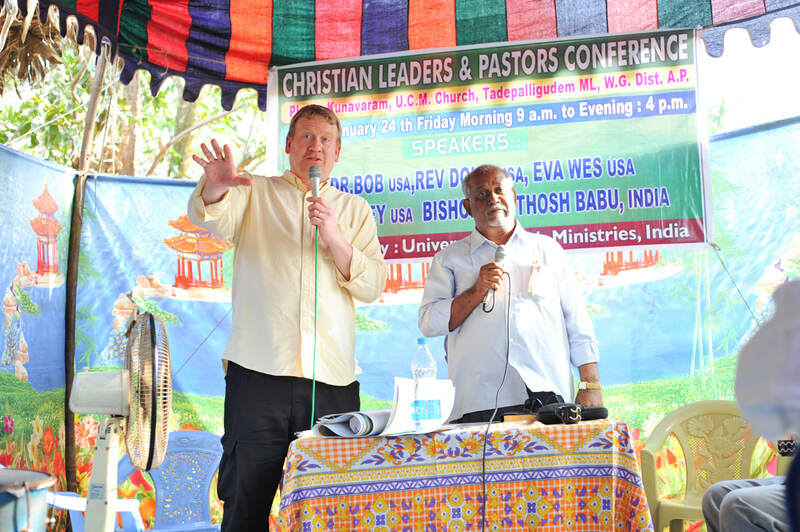 Pastor Bob (below) teaches at a pastor's conference in India hosted by Bishop Santhosh Desabattula.